It's been raining here for the past 4 days and yesterday the rivers started to rise with them peaking last night. I went out this morning with my camera to get some pics for my paper. We are cut off both north and south and there is no food left in the supermarkets (fresh food). After driving around as far as I could get around the valley and not really getting any good shots I called my mate who owns a chopper and he came and picked me up in my brothers drive way. These first view pics are of a river just out of town that is dry for 11 months of the year. 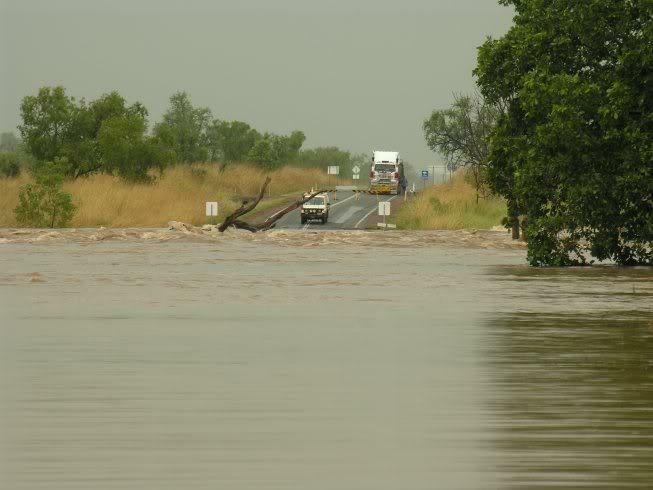 It is the main highway, well its the only road that links us with the rest of Australia. We put the chopper down on the road to get this shot. Same road but different river on the other side of town. This is a friends farm, his land borders onto my brothers property. Damn Memock has this ever happened before there?? 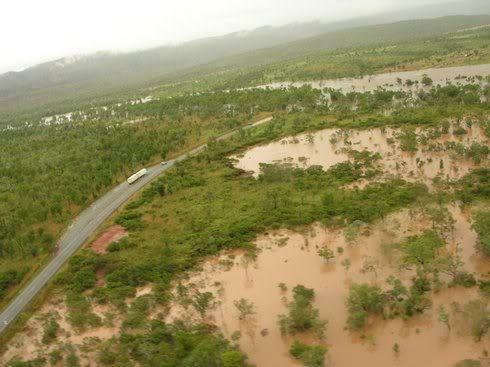 Hurricane in Queensland, and then flooding in Memock land? How many centimeter or inches have fallen during the storm? 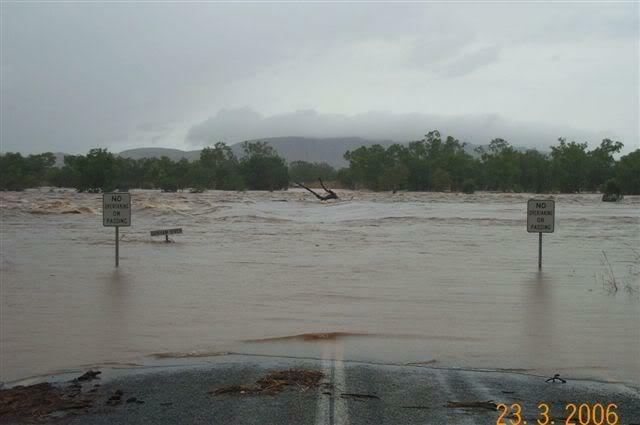 This first pic is Ivanhoe Crossing. Its the old highway and as you can see you can still drive across it. 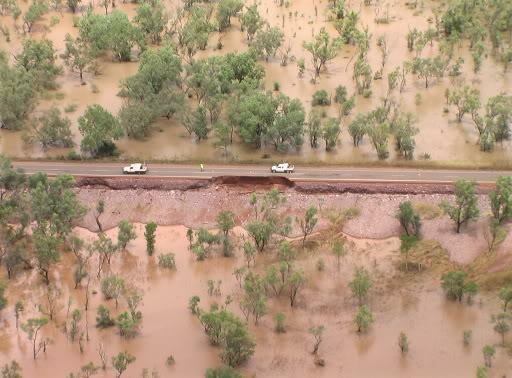 Emergency services in Western Australia's northern Kimberley region say the Victoria Highway between Kununurra, Wyndham and Halls Creek will remain closed until tomorrow morning. 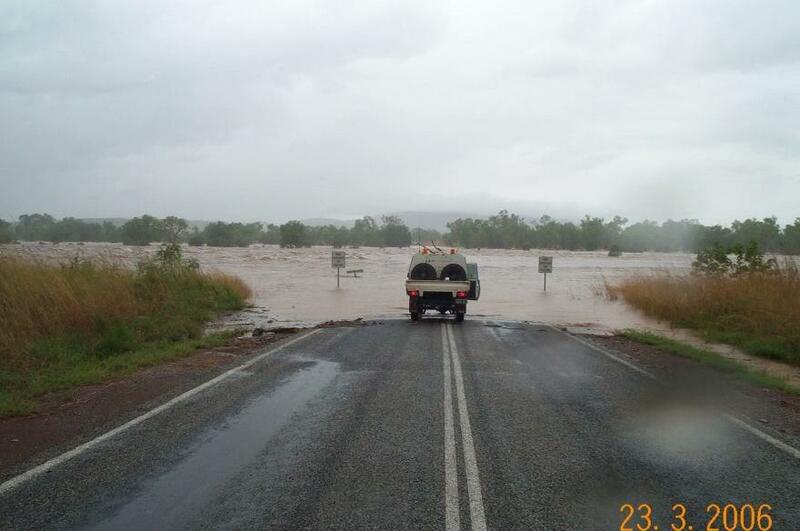 Overnight flooding has washed out many roads around Kununurra, including part of the Great Northern Highway near the town on Doon Doon. The Fire and Emergency Services Authority (FESA) has asked motorists to be patient while Main Roads restores roads. 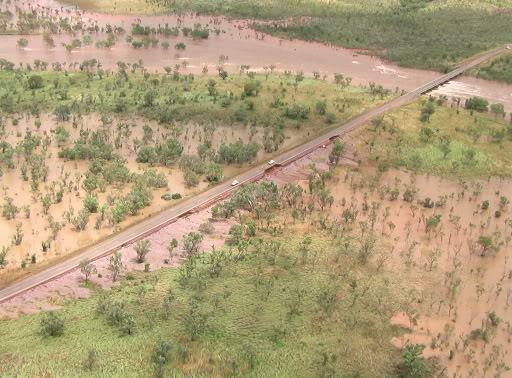 East Kimberley district manager Graeme Down says there is large amount of debris that needs to be cleared before roads can be reopened. "We're also keen to make sure that essential supplies that have been backlogging get through on priority," he said. "So other motorists will need to be patient so that Main Roads can get the essential stuff through first." 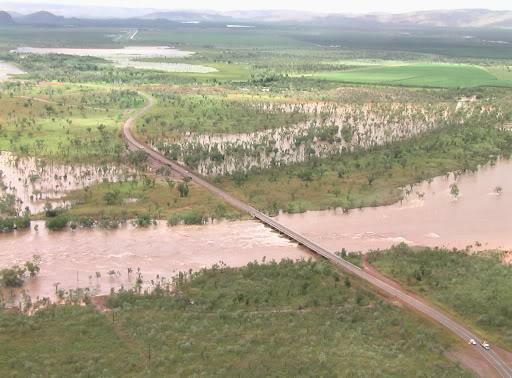 Nearly 300 millimetres of rain has fallen in Kununurra over the past 24 hours. This afternoon water levels dropped by a metre. 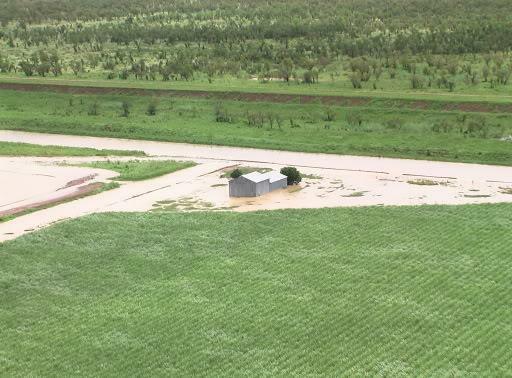 But a tropical low is expected to bring more rain and emergency workers have started evacuating station residents. 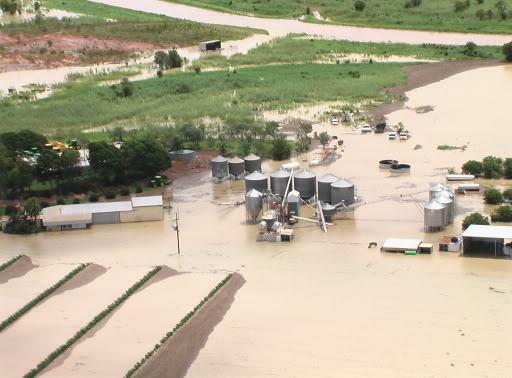 Erica Hutcheonson from Parry Creek Farm near Wyndham says she was reluctant to leave her homestead, but the threat of a cyclone developing forced her to go. "Few trees have come down, big trees, just missed our fuse box," she said. "I think as we were leaving the power was sort of on and off, so we just thought while we can get out, while people are willing to get us out, we'll get out." The tropical low is currently centred near the coast, about 95 kilometres north-west of Wyndham. Great shots MM - Take care and keep dry. If things get desperate we'll organise an emergency drop of Mama noodles. Cheers Danbo, that might keep this missus happy, you can drop me off a roast lamb with mint sauce thanks. Do you mean you're not so sure about the other missus!! Obviously should have read 'the' but hey lets leave it like that - will give the dog something to talk about. Good pics mate - stay safe. I thought you lived in Chiang mai mockers? Well if you are flooded in, I don't think I will look at the arcade, it must be taking a right bashing. I visited Chaing Mai once or twice Mad Dog, thats about it, not sure where you got that idea. Thetyim, I generally don't set foot inside the arcade except for when I am at work so it's safe until Monday! Just got back from the pub having dinner, place was packed with all the people who are usually out fishing and trucj drivers who are stuck in town. awesome pics - aus is a great country ! I take this is not a seasonal occurence. Is this La Nina or just incidental freak weather? Believe it or not we are facing a drought in the UK. Knowing MeMock, the drama queen that he is, his missus prolly left the tap in the laundry running! I was wondering why my wtaer bill was so high! Dougal - i wouldnt say that it is usual, probebly happens every 20 years. What do your brother and friend grow on their farms? Has the missus got any rice paddies going yet? 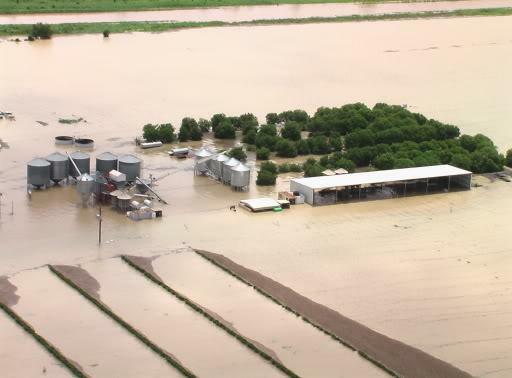 With the amount of rain rice is the only thing that could grow at the moment. The valley has horticluture and the surround areas are massive cattle properties. Sugarcane?? Doesn't the world have an excess of sugar? What do you do with sandalwood? and don't say make sandals! A mate just emailed me these pics. 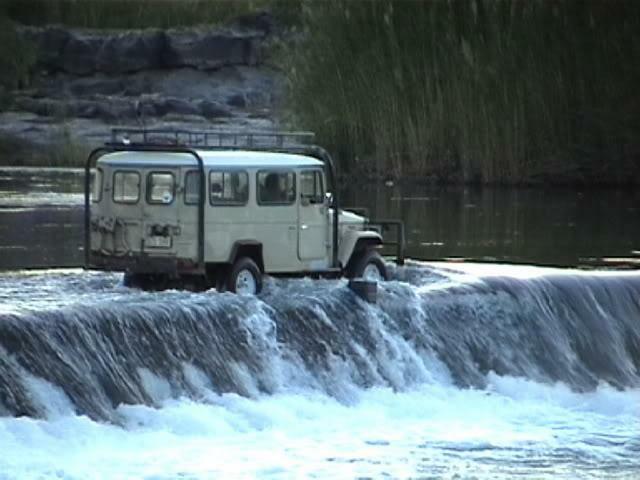 he works on the other side of the river at the Argyle Diamond Mine and was on shift change over but as he couldnt get back to town to see his wife and baby he went to the river and took these pics. 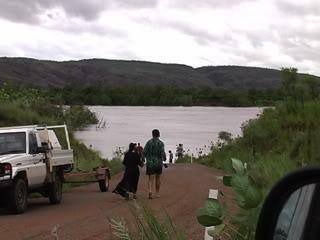 This is the river that is usually bone dry 11 months opf the year. Apart from making sandals sandle wood is used as incense - extremely popular in India and extremely expensive. The MeMock self managed super fund only last week bought 2 hectares. If all goes according to plan in 15 years I could retire on the profits. As for the sugae i would have agreed with you for the last 5 years as the farmers have all been making a lost but in the past 6 months sugar prices have doubled and my brother has rediscoverd his smile and sense of humour thank goodness.